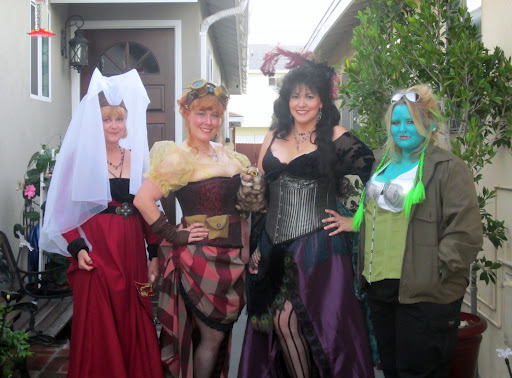 Here is my group heading out to LoJ on Friday night. I absolutely love this event. 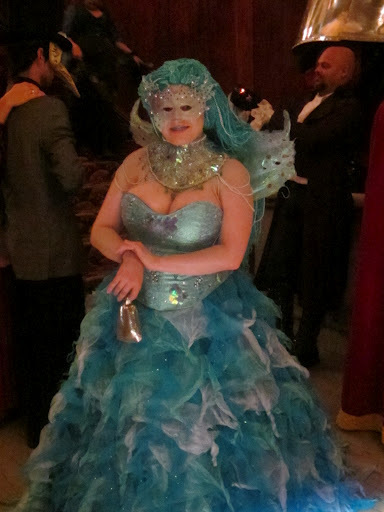 Of course the fact that it’s a masqurade ball is the main reason but still! I really think I’ll be doing both nights next year. One night is just not enough! 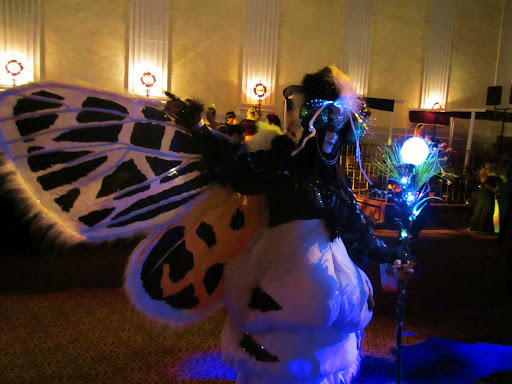 I have to say that this is my favorite costume I’ve made for LoJ to date. It turned out lovely, it fit perfectly, and it was extremely comfortable all night. 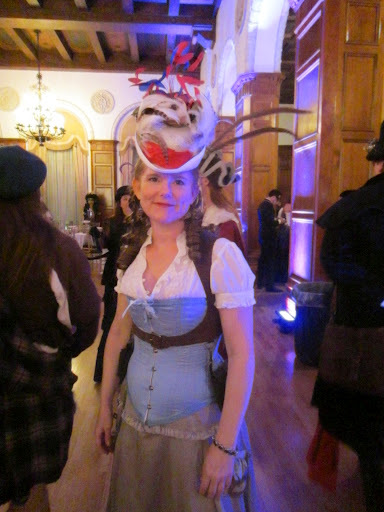 I never wore a corset for long periods of time before so I was shocked how comfortable it felt and how great it was for my posture all night. Pretty dan close, I’d say! I am very happy with the color changes I made. I only wish I had a better shot of the mismatched stockings. They were one of my favorite parts of the costume. Yes, that is a ferret on my shoulder. The character owns a ferret named Senor Squeakypants. Yes, Squeaky is wearing tiny goggles. …what do you want from me? I’m a gamer! Senor Squeakypants was the most popular one in our group that night. I should haul him around everywhere. My friend Jen went as her character and Annabelle’s bestest buddy, Madam Jezebel Norton. We had lots of fun piecing her costume together. And our colors really complemented eachother. The blouse exceeded my expectations. The fabric looked fantastic under the lights, breathed like a dream, and was very gentle against my skin. I loved how the sleeves looked especially. And yup, those are my Regina goggles. I’m getting as much milage out of them as possible. 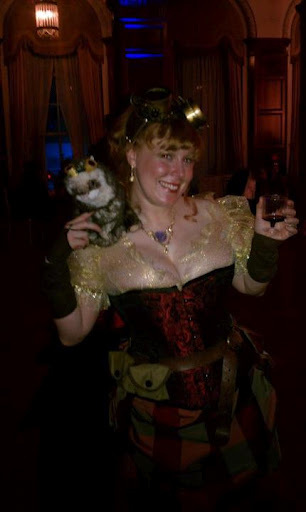 I’m seriously considering hauling the Annabelle costume out to San Diego ComicCon for the steampunk meet up. I would like wear it again. 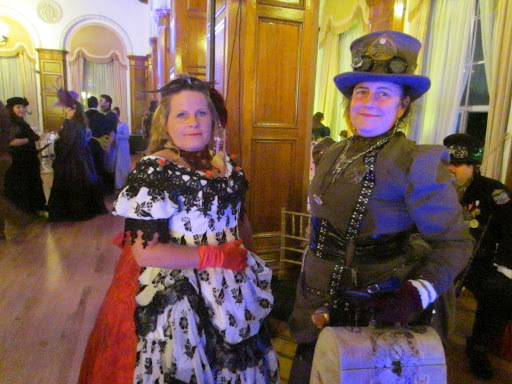 Even though Friday is the quiet night at LoJ I still saw some amazing costumes that evening. Here are some of my favorites! Madam butterfly was my absolute favorite of the night. 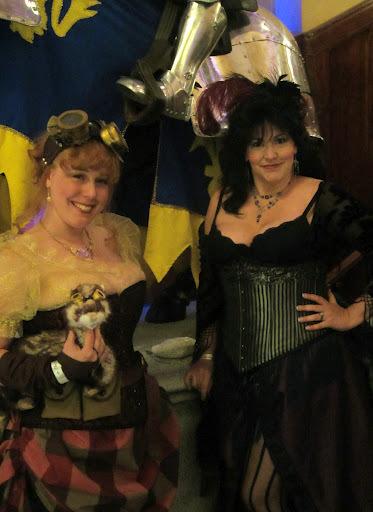 Lovely Steampunk ladies. The photo does not do their dresses justice. 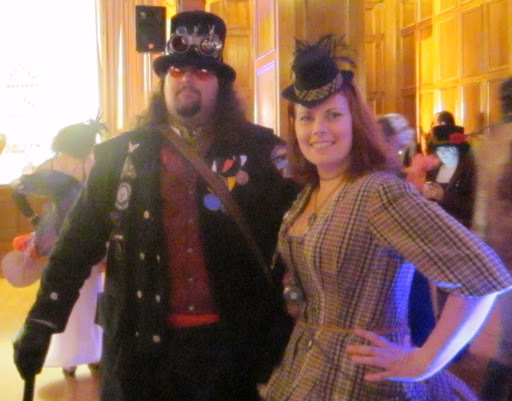 Two more of my cohorts, Capt’n and Michelle looking rather spectacular. SO much love for that hat! 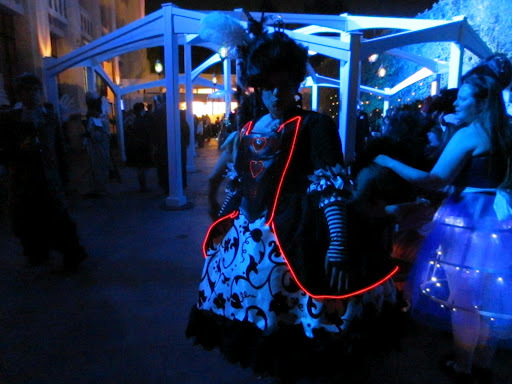 I wish this picture turned out better because this Queen of Hearts was simply stunning! 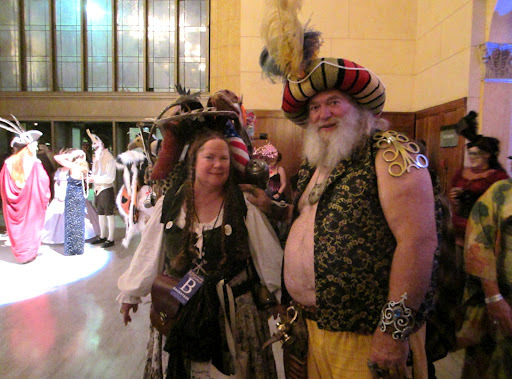 A Junk Lady and a rather jolly Sultan. That hat! So much LOVE! 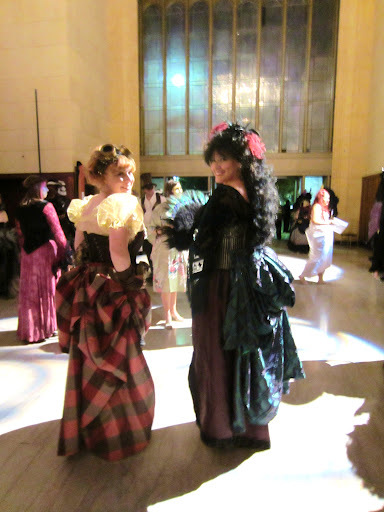 Even though I didn’t make it to Saturday evening, my friend Ace took TONS of photos for me so I could see all the lovelies I missed. I’ll be posting those photos very soon…as soon as I have a chance to look through all of them and drool. I’m already excited to go back to LoJ next year! I’m thinking of putting together some form of Valkyrie costume perhaps for one of the nights. Though knowing me, I’ll change my mind fourteen times before I get there. Until then I really don’t have any pressing projects… which feels odd after almost three months straight of working on things. 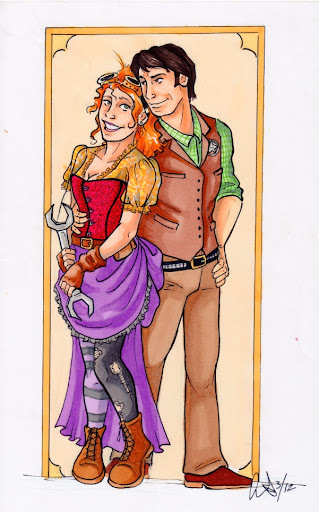 I’ll be probably puttering around with some SCA garb soon (I’m in need of another Viking) and as soon as I find the right green linen, I’ll be putting together Merida’s (from Pixar’s Brave) gown for Halloween. ← LoJ Costume in Progress! Annabelle Leigh Langly.